In the UK we have 18 native species of bat, several of which have been recorded in our area. We have included some ID tips which might help you figure out what’s in the night sky if you keep your eyes peeled! Our most common species by far, look for its zigzaggy flight along tree lines and in gardens. This is amongst our smallest species of bat and likes to roost in the gable ends of buildings, under tiles and in soffits where they’re too small to cause any damage – look out for them flying around at dusk! Its our most abundant bat, as it successfully has adapted to use buildings, especially modern housing, and gardens provide a great feeding habitat. Very difficult to tell apart from the Common Pipistrelle without access to a bat detector (as the name suggests, they echolocate at a slightly higher frequency). In fact, they were only recognised as a separate species to the Common Pipistrelle in the 1990’s! They have a slightly greater affiliation to water and ponds than the Common Pipistrelle and are less frequently found. This slightly larger pipistrelle species is relatively difficult to tell apart from the other two, and has only rarely been recorded in the local area . They’re known for their migrations across Europe and Scandinavia in September. Our first radio-tracking project followed a Nathusius pipistrelle across Stockport and into Cheshire. 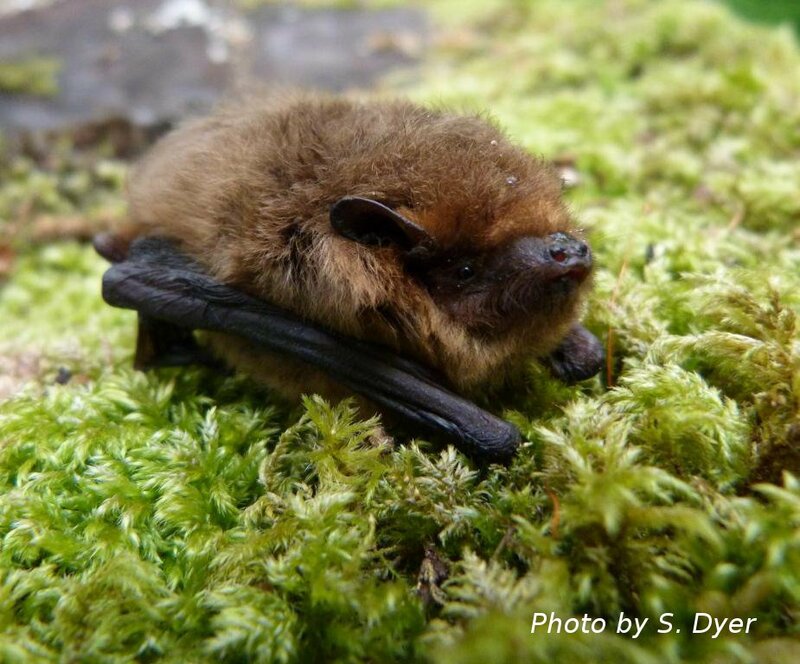 One of the larg est UK bats, these fast flying creatures can be spotted whizzing about high above trees and houses at dusk (they’re one of the earliest bats to emerge of an evening). They generally fly fast and in a straight line with occasional ‘swoops’ as they pick off a moth. Wigan Flashes is a great place to watch them in the summer months. They like to roost in tree holes, so protecting trees and woodland is an important factor in this species’ survival. the hope that their prey (moths, generally) won’t hear them sneaking up on them (hence their massive ears!). A very difficult bat to spot as they stick to cover and tree lines, and are often difficult to hear on a bat detector. They’re reasonably widespread throughout South Lancs, but are more particular about their roosting places than a Pipistrelle. These two small species of bat are notoriously difficult to tell apart but like to forage in woodland and over moving water, generally above the height you’d see Daubenton’s bats. They’ve recently been joined by another recently discovered similar species Alcathoe’s bat, which is a little smaller and has a pink rather than a dark face. We’ve yet to find an Alcathoe’s in South Lancs, but we’re looking! All three species roost in trees and buildings in the summer, but like to hibernate underground. This elusive but fascinating bat echolocates quietly and likes to ‘glean’ prey (that is, sneak up to slow moving insects and nab them). It has a very varied diet, from Caddis flies and moths to spiders. We have a scattered distribution of this species in South Lancs, and a lack of suitable roosts may be a significant limiting factor in population.